Feeling sassy? Get the Borneo. The Brazilian cut butterfly bottoms are draped at the back, but not all the way down like the Brasil, so they provide a bit more coverage. Adjust the strings on the side, turn it around! These reversible and versatile bottoms are an eye catcher anywhere. What else should you know about this top? It’s made of 100% Econyl (regenerated and regenerable nylon), so it’s not only fashionable, it’s also sustainable. Feeling sassy? Get the Borneo. 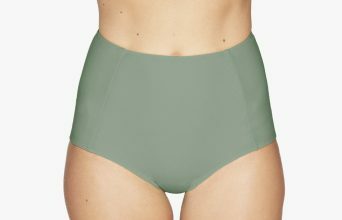 The brazilian cut butterfly bottoms are draped at the back, but not all the way down like the Brasil (Link), so they provide a bit more coverage. Adjust the strings on the side, turn it around! These reversible and versatile bottoms are an eyecatcher anywhere. Whether you like it cheeky or a bit more covered up, you’ll find the OY bikini bottoms to match your taste. Surfing is an active water sport and wipe outs are daily business. Therefore the bikini needs to fit perfectly in order to stay on in any situation. OY products are made for that and will never disappoint you! Our goal is to make you feel comfortable. That’s why most bottoms are adjustable by tightening or loosening the strings on the side. Made of 100% high quality lycra, they feel like a second skin. If you’re not sure about a model, check out our size & style guide to find your perfect fit. With OY Surf Apparel, you never have to worry about your surf bikini bottoms slipping. Just focus on your best performance and go after every wave coming your way. Bottoms up, girls!